Lean and Six Sigma is now mature and must evolve to meet business needs for the 21st century. We recently conducted a survey of our newsletter readers and found that Continuous Improvement (CI) is changing. 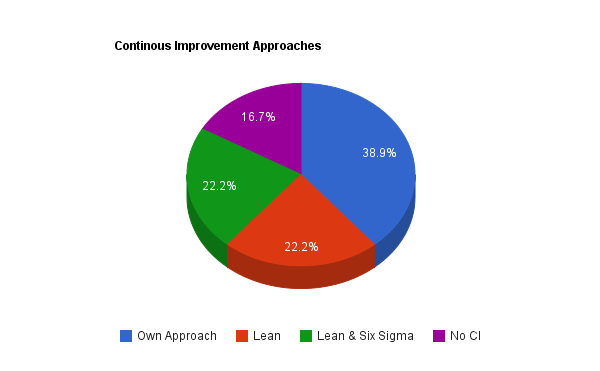 None of the respondents were using Six Sigma alone, 40% were using their own CI approach. 1. What is your company approach to Continuous Improvement Program? 2. To what extent is Continuous Improvement applied in the company? 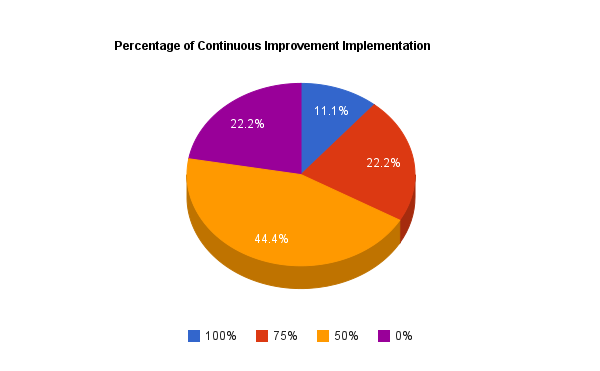 One in five companies report that they do not have a Continuous Improvement program of any type. That is a surprisingly large percentage in today's challenging economy. Lean programs are running out of steam. Lean has to slow down because it is all about cutting and eliminating. When the low hanging fruit are gone the cuts are more and more difficult. A number of companies have "leaned themselves to death" by cutting too deep. Some experts report that up to 95% of them are not successful. We discuss that in detail in "Profit Improvement Executive Analysis." As good as programs such as TQM, Six Sigma, Lean and the combinations are, it is important to recognize that these programs must evolve to achieve their full potential. We are helping companies and programs to evolve and reenergize their Continuous Improvement Programs. Read more on Six Sigma and Lean. 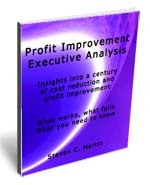 FREE OFFER: Send me an email at smartin (at) profitpro.us I will send you a FREE copy of the detailed white paper "Profit Improvement Executive Analysis" which will give you what you need to know about Six Sigma / Lean, cost reduction and profit improvement programs and assist in your decision making.